Last.fm has always been about recommending you new music, but that’s pretty hard to do for anyone new to the service. We need to know what music you’re into before we can recommend more music to you – right? We call this the “cold start problem”. Up until now we have asked you to tell us what artists you like in order to kickstart your profile, but from today new users can use Facebook Connect to populate your Last.fm profile with any artists you like on Facebook. Neat, huh? It means we can start delivering you new music recommendations straight away, and give you a better experience of Last.fm from the moment you create your account. 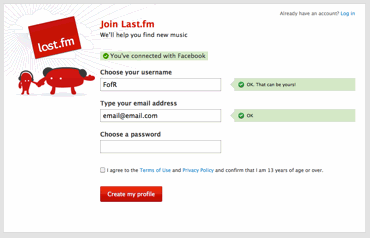 You also have the option of using your Facebook profile pic, name, birthdate and other info to help complete your Last.fm profile. All of this information is editable, allowing you to select only the details you want to bring across to Last.fm, and you even have the option to trash all of it and start from scratch with just one click. Actually, we’ve made a few changes to social features recently. We’ve renamed the Facebook ‘Like’ button to ‘Recommend’ (no change to functionality though) and also added the new Facebook ‘Send’ button. The Send button allows you to recommend an event, track or artist to specific friends or groups on Facebook as a message to their inbox rather than publishing to everyone via your feed, pretty useful for music you really don’t want your friends to miss out on but don’t want to spam everyone else with. There’s more coming soon too, including the ‘Friend Finder’ – helping you find and add your friends from other platforms – which we’ll be launching in the next few weeks. Please don’t forget to give us feedback about features like these on the forums. Connecting your existing Last.fm account to Facebook has not been released yet, but will be soon – don’t worry, the love is not just for new users! Yay! This is pretty cool! That is why I tried to get as much music artist pages that I like on Facebook as possible into my profile. So I’m waiting for enabling this functionality for existing Last.fm users (as mentioned by Ben XO: “soon”). Yay! These are some great new features! Hopefully, Last.fm will become more social again – can “Loved” tracks get published into our Facebook and Twitter feeds, like they used to? Haha good comedy. I posted over two years ago that you needed to make finding friends easier and yet I have to wait even longer? Ah you guys crack me up. That’s why we all use Spotify these days! when does FB conect go live? I’m not interested in anything where FB could take data from my profile. If I wish don’t get control with my data, I will use FB for that. I would prefer better improvements in the page as in the database artists too: better name-artists-concordance & corrections, better radio-recommendations (as Pandora, e.g. ), etc. I’m the only one who think this way? darn, went looking for the setting to start using this with my profile – looks like i have to wait longer :-( will you be contacting vip subscribers when this feature is ready? Why FB only?.. If you want to make it social, either go all the way, or just import friends from there.. The way this is going, I think that this new “feature” was a backward move..
Nice. Speaking of recommendations, how can I stop last.fm from “only” recommending local music? It seems like 90+% of the recommendations are from Norway, but I seldom listen to Norwegian music. nacho – Don’t worry, we won’t be ‘giving’ any information to Facebook if you use the feature at sign-up; it’s basically to import some of the bands and artists people have already filled out their FB profiles with to kickstart recommendations for new users. Andy Piper – with the Friend Finder we’re discussing a subscriber Beta for it, and it won’t only be Facebook friends you can find with it. Facebook – who cares? Friend Finder – yippee! 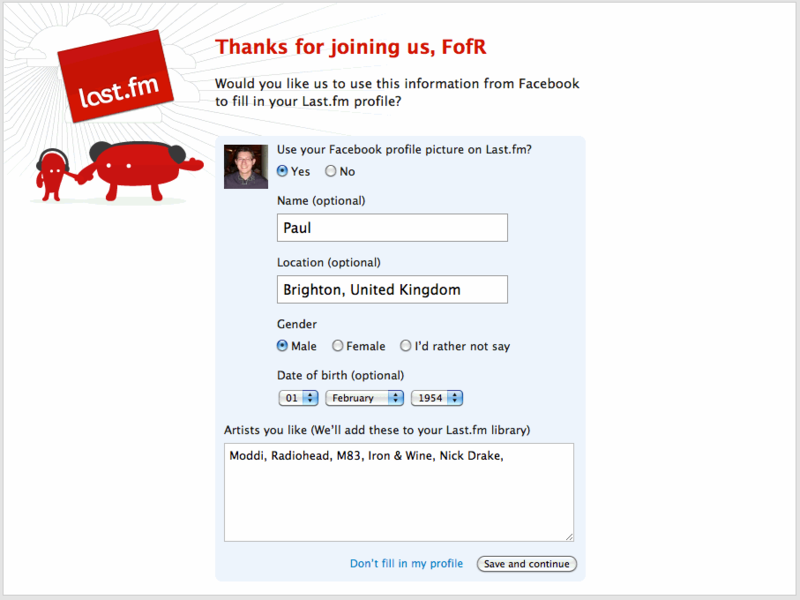 facebook and last.fm shouldn’t mix! guys, lastfm’s cool enough, we dont need facebook to take over our music too! FB is becoming an octopus’ big brain!! What about the other side, i mean is it possible to like artists in facebook based on the artists i like on last.fm ? Any plans on using Facebook authentication on Last.fm in the foreseeable future? the Face – no thank you. There are already a bunch of apps that exist for this (at least there were when I last checked a few years ago). On top of that, I don’t think facebook needs to know anymore information about me that undoubtedly my ignorant friends will leak to them. I know it’s mentioned that facebook won’t get that information, but I just don’t trust facebook. If you make some integration for Diaspora (when it comes online), let me know. Friend Finder – I am all for that. aprovencio – yes you can now do this. On any artist, album, or track page, simply click the new Facebook ‘Recommend’* button, and this will now post the artist to your Facebook wall and add them to your Music section in your profile (under Arts and entertainment). You can remove them from your Facebook profile by going to Profile -> Info -> Arts and Entertainment -> Edit. Click on the item and then click ‘Remove’. Cool! I love music and facebook, now I can have both of them in the same place, I Like! I think this was a brilliant idea and great way to expand user interest. I for one will be using it a lot, can’t wait to get started!